Life is strange. More than strange. Incomprehensible. Life mixes pain and joy, so we stay alive. Life gives pain, we have to pass. So many friends died. My only child died in January. My mood turned into black depression. The husband of my dead daughter shares my feelings: The morning doesn't look attractive to stand up. But we have to stand up, to get our things done. That routine is the best to pass pain. 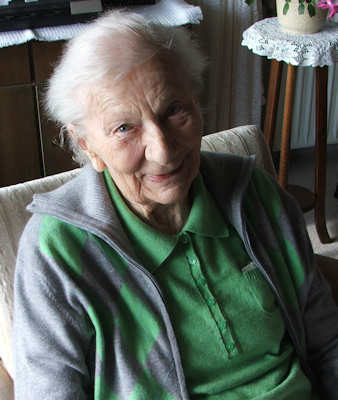 The body, mind, heart grows older and gets used to regular routine with work, walks, food, bath and the entertainments via media: web, newspapers, books, poems, pictures, music, films, tv. Although life looks quite easy and comfortable, the mind mixes a poisonous brew from the news. Good news are no news, so most news are bad. But bad news poison the mind. Everybody knows and experiences this. Satsang priests and enlightenment entertainers help to clean up the mess in our mixed up mind. A good red wine helps too, to sleep more peaceful. But bad news don't disturb in happy moments, in little life adventures, in meetings with friends like in Mimas birthday celebration. 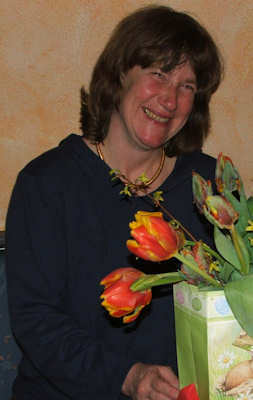 Lovley Mima cebrates 50 years on last February week end in Bamberg. And 13 years we have shared together growing in joy, sorrows, peace, quarrels and fulfillment. 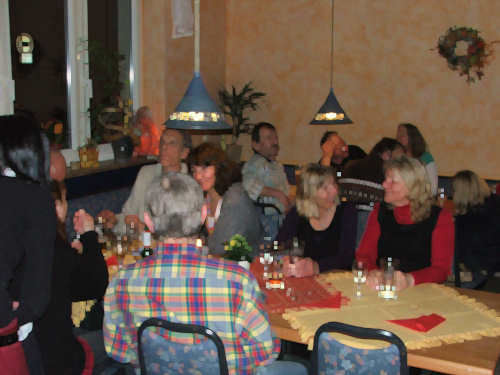 Bamberg Guesthouse Hell No 13 Friday night around 30 friends come together in a vegetarian restaurant to meet Mimamai. 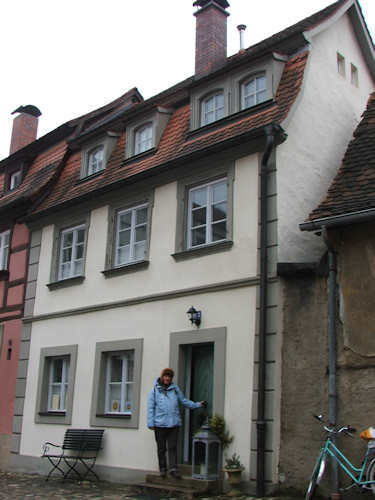 We have rented a renovated house from the Middle Ages with four bedrooms. The name of the street is 'Hell', the house number '13'. We empty five bottles champagne, listen to the mechanical street organ, quarrel, fight and share together food, drinks and energy. Mima feels blessed, she is. Visit to my 88 years Old Mum Sunday we cross Germany from south to North West, Mima prepares in Aachen the wax for her next Christmas candles. 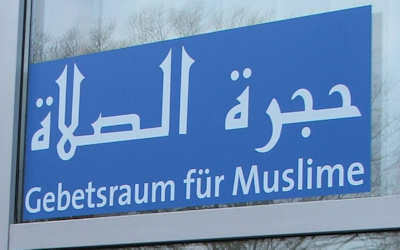 My next visits are to my brother and my old Mum in Dortmund. 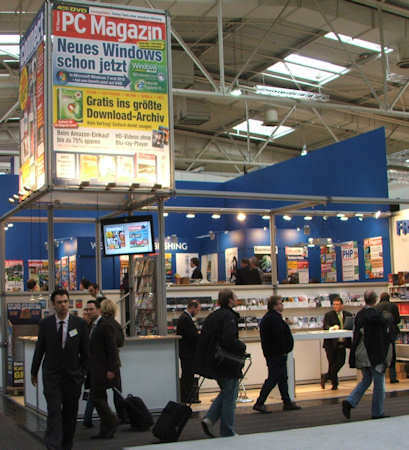 Monday it is my job to visit the computer fair CeBIT in Hannover. A young colleague is sick, so it is my turn again after seven years to spend three nights in Hannover and explore and enjoy the technical news and the busy fair adventure. The advantage with a technical magazine: most news are good, because technics help to live more comfortable. My intention to participate in evening events of luxury and vanity is less and less, but the job to explore the CeBIT is exciting and chases my sadness away. These technical impressions push my mind out of my darkness and bring the attention back in the 'here and now'. With relaxed face and calm voice, with nice face and friendly words it is easy to be friend with everyone. This friendliness is not even a bargain for better connections; this friendliness shines up, when the dark valley of despair and suicidal sadness is left behind. If this better behavior stays with me for a while or will be left behind soon again, who knows? 2009 the visit is more relaxing, It's a common experience: Life is strange, a mystery. Sometimes life is a marvelous mystery, sometimes a mediocre misery. Some strange higher energies than our poor prayers decide for us, what, how and how long we live. 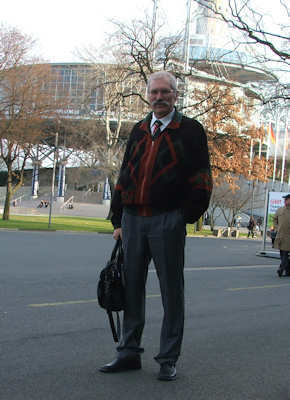 My last visit was 2002 on my private imitative.Today on my second day it reminds me on my first visits on CeBIT 19 years ago. My daughter still was a child, my energy was wild to fight for news, money, connections, evening events. Hannover was much more crowded, the halls were filled with people, it was hard to hurry from one event, one meeting to another. 2009 the visit is more relaxing, much more relaxed. It's a feeling like a senior journalist watches from his hill of foolishness the young ones fight in the valley to climb the hill of foolishness too. 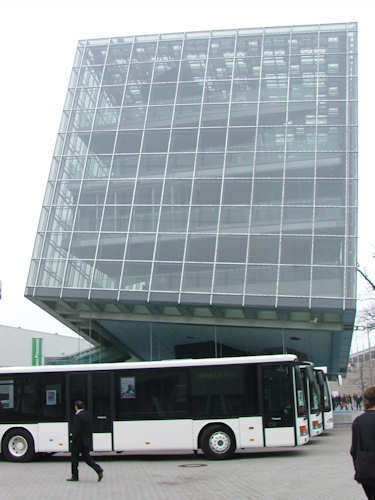 it reminds me on my first visits on CeBIT 19 years ago. 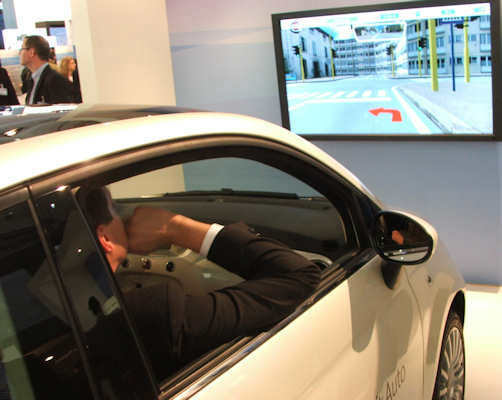 Fiat and Microsoft have developped a car and software to save energy. With an USB-stick in your Fiat 500 you collect all data during driving. 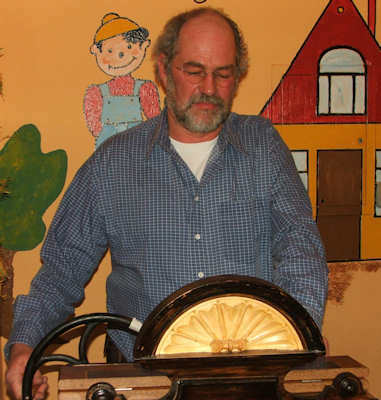 The software analyses afterwards, how to save money, gas oil and CO2 pollution. Volkswagen builds the next generation of Polo, who consumes less than 4 litres diesel for 100 kilometres. 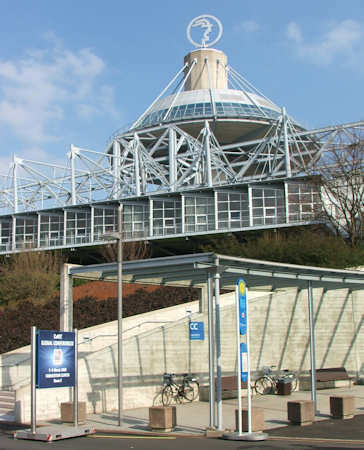 Hannover is near to Wolfsburg, the home town of Volkswagen factories. Arnold Schwarzenegger visits with chancelor Angela Merkel the CeBIT fair. 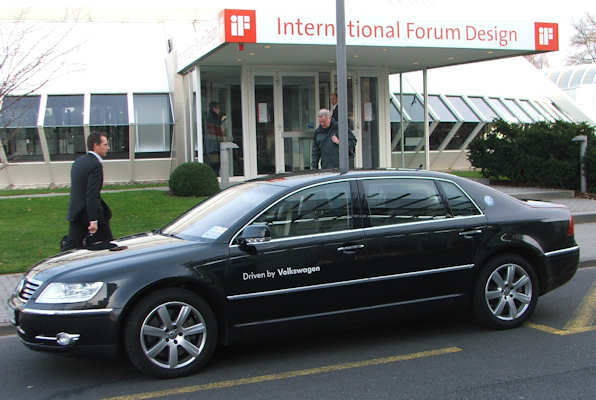 Volkswagen sponsers the luxury Phaeton limousine for these 'Very Important Persons'. 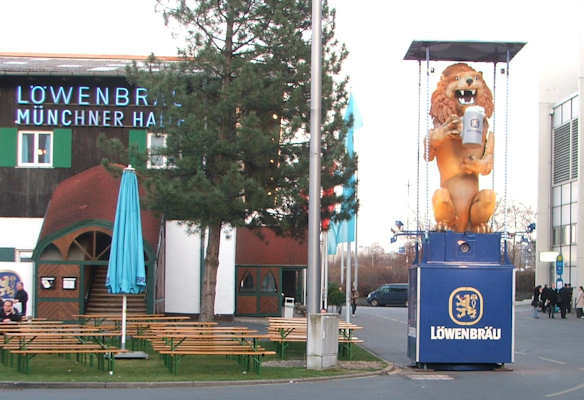 in a 'Munich Hofbrew Temple' with a huge roaring plastic lion. although the tough finance crisis demolishes most buisiness.